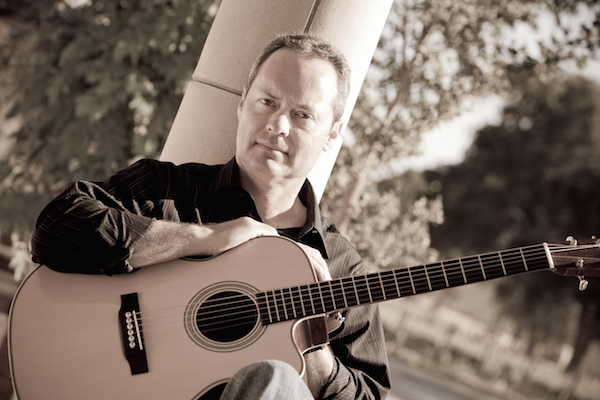 Martin Paris is a contemporary acoustic finger style guitarist. Drawing on inspiration from California’s pristine wine country, under layered by a strong faith and family, Martin brings his versatile array of original material and adds his unique style to some familiar favorites. His music takes you on an instrumental journey by blending pop, rock, folk, blues and ballads. Listeners and fans have called the music catchy, toe-tapping, beautiful and profoundly thought provoking. Martin was first taught guitar by his father at age twelve. Shortly thereafter becoming influenced by such artists as Eric Clapton, the Doobie Brothers, James Taylor and Loggins & Messina. As he honed his craft, finger style influences included Laurence Juber, Tommy Emmanuel, Peppino D’Agostino and Acoustic Alchemy. Martin has three projects available and released on Solid Air Records, a Grammy award winning label, “Turning Point” “Guitarist Off The Vine” and “Acoustically Speaking”. His performances include the Cuesta Performing Arts Center in San Luis Obispo, a repeated featured artist for the Lazy Locals Concert series at Castoro Cellars, Morro Bay Harbor Festival, featured artist for Steve Key’s Songwriters at Play showcases, and countless appearances at over 80 area wineries and venues. Martin has also opened concerts for Grammy winning guitarist Laurence Juber, Peppino D’Agostino and singer songwriter Karla Bonoff. As well as performing on KCBX and KRUSH radio and KSBY television in San Luis Obispo. “The acoustic guitar inspires me to create. As I continued to grow musically, my experimentation with altered tunings led me to some of the great finger style players. Many of my compositions are my emotional response and a reflection of events in my life. Music is a gift from God that I love to share”. "This is the sixth solo guitar release from Martin Paris, who performs extensively around Northern California’s wine country. Although Christmas albums are somewhat of a staple and perhaps a cliché for solo guitarists, this recording has much to recommend it. First, the audio quality is beautiful – I fell in love with the guitarist’s tone after listening with earbuds. Secondly, he’s an able arranger, creating variations in different registers of the guitar and adding tasteful chordal interludes. Paris performs the entire set on steel string guitar, utilizing a well-developed fingerstyle technique. Highlights include the album’s opener, "Deck the Halls," "The First Noel," "What Child is This?," and "Joy to the World." On "Silent Night," Paris employs the aforementioned arranging devices for one of the most successful pieces in the set. This disc will reward serious as well as casual listening and undoubtedly will sell well at Paris’s gigs. " © Patrick Ragains - Minor7th. Click here to read the Paso Robles Magazine on Martin Paris' "Turning Point" CD release. "Martin Paris is a fine fingerpicker, as revealed on "Acoustically Speaking," his third solo recording. It's fitting that Paris is playing a Martin OMC-LJ28 on the opening cut, "Acoustic Attitude." The tune reveals several elements (walking baseline, chord patterns) that reflect the stylings of Laurence Juber, the inspiration for that Martin model and obviously of this piece, even down to Juber's common DADGAD tuning. Paris does well in matching the titles of his songs to their feel. For example, "Low Resistance" is meant to show that even in life's trials, there are better days ahead. So the guitar whines and moans with string pulls and call and response treble and bass parts to reflect our common lot with a hope that all isn't dark. "Twenty Seven Ocean View" contains some lush chordal work augmenting a sweet melody. The Beatles' "Norwegian Wood" – covered by hundreds of players – gets a lively arrangement. You can tell Paris is a Beatles fan. "Liam's Lullaby," written for his first grandchild, is a sweet melody full of warmth and light. We even get some funky 12-bar blues on "Deja Blues." Paris understands the dynamics of a fine steel string guitar with its shimmer and sustain, and uses it to good effect on most all the songs on "Acoustically Speaking." This is really a disc of life, love, and faith, and Paris infuses his playing of these 12 tracks with the personal quality all good music possesses." - by Kirk Albrecht.